I arrived at the restaurant and waited for my Witness friend to show up. He was a little late and brought a new guy with him. My regular Witness friend and I did our normal small talk and as I promised myself, I brought a pen with me. It is the coolest pen I’ve ever seen and was made for me as a gift by a good friend of mine for CHRISTmas. He liked the pen too. Whenever a new person comes with my regular Jehovah’s Witness, I always like to ask them a little bit about themselves. I want to get to know them a bit and see if I can find out what makes them tick. I did the same with the young man. KW: So, JW2, tell me a little about yourself. JW2: What would you like to know? JW2: Uh, I’m a Jehovah’s Witness and just another guy I guess. KW: Oh, no. There’s got to be more to you than that. What is it with these guys? Every time I ask a Witness about themselves, this is pretty much all I get. They are a JW and there is nothing special about them. It is like pulling teeth to get these guys to talk about themselves. They act like no one has ever asked them this question or that it has never occurred to them that they are individual people with individual likes and dislikes. This is an announcement to all of the JW ladies who may be reading this. If you want to marry another Jehovah’s Witness, I don’t blame you. It is very important for a marriage that you are on the same page with your spouse when it comes to spiritual matters, but please, Please, PLEASE find a mate who is more than just a regular guy and a member of your religion. Why marry at all if they are all alike? I kept asking more questions and got him to open up a little. He is a likeable guy and does have personal interests, but like I mentioned above, it is difficult to get guys like this out of their shell. It is important for me that they know they are important to me. Did that make sense? Anyway, I care about these guys and want them to know that I am interested enough in them to ask. Too many Witnesses would rather launch into a discussion with someone without knowing anything about them. Once we finished getting to know each other a bit, we started reading paragraph 23 on page 17 of the Teach book. I absolutely LOVE the question for this paragraph on the bottom of the page. JW1 read it. KW: Because you will not know the answer unless you ask the question. JW1: Right. Would you want to remain in ignorance or do you want to have knowledge? KW: Did I ever tell you about my philosophy about asking questions when I am on the gun range? JW1: You did and I was telling JW2 about that on the way over here. Your asking questions is a very commendable quality and it is very rare. Particularly with people who have knowledge, like you do. They may think, “I know all the answers. I don’t need anything else.” It is commendable that you are not like that. Jesus said we are to be like young children. KW: Yep. I have a friend who likes to tell people to read the gospel of John with the eyes of a child. JW1: That’s a nice way to put it. We then read Matthew 18:2-4 which speaks of Jesus telling us to be like children. We also looked at Acts 17:11 which tells us to examine the Scriptures to see if the things Paul was telling the Bereans was true. KW: There are two things about this passage that have always struck me as interesting. Paul is the one doing the teaching, an Apostle. You would think that someone with that kind of authority would, 1) would not be questioned and, 2) would not expect to be questioned. Neither of those happened. They Bereans questioned and he commended them. JW1: That’s right. That’s exactly right. My Witness friend then went on to talk about how Paul was a big-time rabbi before he was a Christian and then on the road to Damascus, had an experience which turned his life around. Paul left everything to follow Jesus. His enemies became his friends and all of his former friends became his enemies. I thought that was an interesting thing to say because as we become Christians, we really aren’t supposed to have enemies. I took the opportunity to explore the idea about how much courage it took for Paul to leave his faith community and become the target of assassination attempts for following Jesus. To my surprise, JW1 understood and even offered more examples of how hard it would have been to leave Judaism. JW1: Yes, the Jews had thousands of years of history, they had the temple, they had everything and now Paul is going to start chasing after a dead guy? KW: I was at a religious conference last year and one of the speakers asked the audience what we would do if we found out that Christianity was not true. I was sitting with two of my friends and all of us at the same time said, “We’re done.” We didn’t interrupt the speaker, but we said it loud enough that people a couple rows ahead of us heard it. If Jesus was not raised from the dead the way He said He would be, then what’s the point? JW1: Yes, Paul wrote that if Christ was not raised, then we above all mankind are most to be pitied. KW: Right. If you find out that what you believe isn’t true and it doesn’t change your life, then you never were really committed to it. KW: If I ever found out that what I believe is wrong, you better believe I’m done. JW1: Exactly. That is what Paul had to do. That is what every single one of the apostles had to do. That is what the Bereans were doing when they were carefully examining the Scriptures. That takes a tremendous degree of integrity, fortitude and sincerity. JW1: Absolutely because you are taking yourself out of your comfort zone and putting yourself in God’s hands because you are walking away from everything. Wow. I hope he remembers all of this if we ever get to the point where is seriously considering his involvement in the Watchtower. I’ll remind him if he doesn’t remember. I also thought of a number of my readers who have put up with a bunch of garbage for doing exactly what Paul did. He left his former faith and became public enemy number one. So have most former Jehovah’s Witnesses, but according to my friend, Paul showed integrity, fortitude and sincerity. So have you. KW: It takes courage to leave and it also takes humility to re-learn everything. He said that like he had never thought of that before. Paul had to be humble and even though he knew the Law and the Scriptures, he had to re-learn what he knew from a completely different perspective. KW: Think about it. Paul was a Pharisee. He knew his Bible better than you and I do today because they had to memorize it. To think that he had to relearn from the very people he was persecuting… that takes humility. JW1: People he considered, vile and ignorant. What did they know? They hadn’t been to the rabbinic schools, but Paul learned anyway. Wow. Thankfully those Jews who became Christians, it wasn’t that they had to recognize that the Mosaic Law and Jewish arrangement wasn’t the truth, but rather that the truth had progressed. Paul is an outstanding example for us of humility and courage. How does God view it? Noble-minded. so much so that God had their example recorded in Scripture. KW: I can imagine the Jews telling Paul, “We have all this history, we have this pedigree, we have the Scriptures. We have all this stuff and if you leave us, you are leaving God. My Pioneer friend completely agreed with me that the Pharisees could have said those things to Paul. I hope and pray that one day if he catches himself saying that to another Jehovah’s Witness who is leaving the Watchtower, he will begin to see himself as the Pharisee. I took a gamble and asked a hard question. KW: What would you do if you found out that what you believe isn’t right? JW1: I would do what I already did. I would abandon it. He began to go into some of his background again and explain how he had to abandon a certain lifestyle to become a Jehovah’s Witness. He explained that his behavioral and belief changes didn’t come overnight, but that once he was convinced he was wrong, he changed. KW: What would you do after that though? I know people who have left their community of faith and then have become atheists. My thought is that if leaving a particular religion makes you believe there isn’t a God, then you never really believed in Him to begin with because you have equated the two. You’ve equated God with your previous religion. JW1: That is exactly right. KW: But if you leave your religion, and are still faithful to God, that means you are going to still search for something instead of bagging the whole idea and saying there is no God. My Pioneer friend continued explaining his past and what he overcame from 15 years of drugs and alcohol. He lost friends, but according to him, has gained a brotherhood of eight million “true” brothers and sisters. He then took an unexpected left turn in the conversation. JW1: As an organization, Jehovah’s Witnesses believe that if we have perceived that what we have taught and believed is wrong, we change. KW: How does that change work? Is it something that comes from the top down or can it also come from the bottom up. I knew that wasn’t true. A prophet of God, the “Faithful and Discreet Slave” who supposedly receives messages from God, is going to listen to rank and file Jehovah’s Witnesses who have zero authority and can’t understand the Bible without the organization in mind? What is the point? My Pioneer friend began explaining how people can write a letter to the organization asking questions about doctrine and the organization supposedly considers other points of view and may actually change because of someone’s observation in a letter. He explained that this is how change can be made from the bottom up. Then he began explaining how it works from the top down. This got interesting really quick. JW1: Like the first century Christians, we have a Governing body, a group of Christian men who take the lead in the world-wide organization. He told me about Acts 15:1-29 and how they believe that there were men in Jerusalem who had control over what all Christians believed. It was the same standard explanation I have heard many times before. 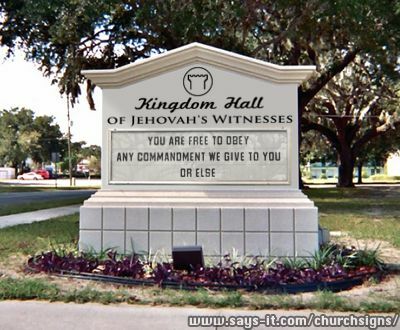 KW: So this governing Body is over 8,000,000 Jehovah’s Witnesses? JW1: Well, “over” is not really the right word. They take the lead. KW: So, they are over them. JW1: We view Jesus are our head. KW: Sure, but Jesus isn’t going to answer your questions when you write a letter to these guys. He began laughing and understood my point. JW1: They direct the earthly part of the organization. KW: And they’re in Brooklyn, New York? I gave him a look like, “Yeah, right.” He surprised me and then instantly regretted what he said next. JW1: Historically, there have been many things that we have had to adjust. KW: What do you mean? JW1: For example, we use to have no problems with people who smoke. “Sure, you can be a Christian and smoke, it is no problem.” Then we came to realize that smoking was a defilement and scripture says to cleanse yourself of every defilement in flesh and spirit. Life is a gift and smoking clearly endangers that gift. Initially it was that if you smoked, you couldn’t take a position of responsibility. Then it came to understanding that smoking is wrong in God’s eyes and if you are going to smoke, then you cannot be one of Jehovah’s Witnesses. JW1: That is not an easy thing establish. KW: Are they consistent with other things that are harmful. KW: Like obesity? Do you have fat JW’s? He laughed. I wanted my joke to be as light as possible (pun intended), because I knew our conversation was about to get heavy (again, pun intended). JW1: Occasionally, but that is a little more delicate because food is not a poison. KW: But gluttony is a sin. JW1: You can be removed from being one of Jehovah’s Witnesses for being gluttonous. KW: When is the last time you’ve seen a fat person get kicked out of your organization? The two Witnesses looked at each other. He paused as if he was reaching back into the furthest reaches of his memory. KW: So then it is not consistent. JW1: Well, there is a difference between being obese and being a glutton. KW: In America, most of us, who need to lose some weight, myself included, it is because of gluttony. Think about this. People can get kicked out of the organization for smoking, when smoking isn’t even mentioned in the Bible, but you are allowing gluttony, a sin specifically mentioned in the Bible. There is no consistency at all. He again tried to make a distinction between those who are obese and those who are gluttonous. He also mentioned thyroid issues. I knew he would go in that direction and that is why I said that most obese Americans are obese because of gluttony. KW: Are you suggesting that all obese Jehovah’s Witnesses have bad thyroids? All you have to do is look at the statistics between America and the rest of the world. JW1: Uh, yeah. Okay. But, obesity is not a sin, gluttony is. KW: But would you agree with me that most obesity is due to gluttony? He knew it was true, but he didn’t want to admit it because it proves that the Watchtower is being inconsistent with their policies. What I said next angered him. KW: It just seems strange to me that you would pick one sin and not be consistent. He spoke slowly and his eyes blinked very quickly as if I had just slapped him in the face with a wet sock. JW1: Well, I don’t know how I can be anymore clear, but gluttony, the sin is on the same par, but obesity is not a sin. We can debate the causes until the cows come home, but nowhere in the Scripture does it say that being overweight is a sin. KW: And nowhere in the Scripture does it say you should be kicked out for smoking. JW1: But it does say that we should cleanse ourselves of defilement. KW: Who in the Bible was kicked out for not cleansing themselves of defilement? JW2 had this concerned look on his face like he thought JW1 and I were about to get into a fist-fight. It was pretty tense. JW1’s response to my question was to start quietly flipping through the pages of his Bible. The three of us sat there in silence for nearly a minute. As we were sitting there, I thought of a question that I believed would help him understand a more scriptural view. KW: The Bible says we are not to be drunk, but does not condemn alcohol altogether. You can drink wine and not be a drunkard. Is it possible to that someone would be allowed to smoke a cigar or a pipe every now and then as long as it is done in moderation? My Pioneer friend made what I thought was a good point about there being a difference between wine, a food product and tobacco, a drug. We also talked about coffee. I pointed out that it is a food, but most people treat it like a drug. He laughed and that relieved the tension in the air. JW1 asked me to read 1 Corinthians 5:9-13 which lists a number of sins for which someone could be removed from the Church. He made the point that even through drunkards are mentioned in verse 11, it doesn’t mean that alcohol is strictly forbidden. I suggested that the same principle could apply to the difference between a chain smoker and someone who smoked a pipe every now and then after a good meal. KW: Oh, so your prejudice, that’s what it is. The three of us laughed pretty heartily. Poor JW2 wasn’t sure what to think. I got the distinct impression that he had never seen someone talk to an elder like that before. Our conversation shifted to other addictions and then eventually back to when the Watchtower made the doctrinal change to disallow smoking. JW1: We started this part of our conversation talking about what we do when we found out that something we are doing is wrong. You change. Do you think it was a politically advantageous maneuver to tell your entire world-wide congregation, of which maybe 20% were smokers, that you can’t smoke anymore? KW: I’m not too concerned with what is politically advantageous. I am all for giving people principles and then letting them make decisions based on their own conscience. For you, your conscience tells you that you can’t smoke. For me, my conscience says moderation. JW1: Ultimately, that is the way it works. We give them principles and they make their decision. KW: Yeah, but then you kick them out if they don’t make the decision you want them to make. JW1: If they make that decision, then they are choosing not to be a Jehovah’s Witness. Remember what we looked at in 1 Corinthians chapter 5? KW: Right, but I don’t see someone having a cigar or a pipe once a week as being an issue. It certainly doesn’t rank among the sins listed in this passage. Your conscience would say no because of your background and I fully understand that ad would never try to talk you into doing that because I wouldn’t want to stumble you. But for me, I’ve never had that problem. So for you to tell me that I can’t do something of my own free will, something that I honestly look at Scripture and say, “I really don’t see a problem with this,” that doesn’t make sense. It comes across as you telling me that I have the freedom to make the decision that you want me to make. JW1: No, no. You have the freedom to make whatever decision you choose. You just cannot be one of Jehovah’s Witnesses if you refuse to live the way that we’re instructed to live. KW: What is so bad about having a cigar once a week? JW1: It is potentially addictive. KW: I’m a grown man. JW1: It is physically dangerous. KW: I’m still a grown man. JW1: And it is rebellious. KW: Only because you’ve arbitrarily said I can’t do it. Coca-Cola is potentially addictive and is physically dangerous. Would I be rebellious if you told me I couldn’t drink it anymore? The issue that I am having is, why train people to use their own conscience if they really don’t have the freedom to use it? JW1: But they absolutely have the freedom to use it. At this point I put my fingers in the shape of a gun, leaned across the table with my “gun” to the side of his head, and said, “You can give me your wallet or not.” BANG! JW1: Nobody is holding a gun to their heads in the Kingdom Hall. I really want to use some choice language right now, but that is straight up bull sh…avings. I know people who suffer from having left the Watchtower. Their family and friends are no longer allowed to speak to them or they face expulsion from the organization too. You either tow the party line or you lose your family. How is that NOT putting a gun to their heads? KW: Paul got kicked out of his faith community for what he believed. If in ten years from now, I am a Jehovah’s Witness and I decide that my conscience allows me to have a cigar, but then I get kicked out. Are you telling me that I am no longer apart of them because of a cigar? JW1: Ultimately, this is what it comes down to and it is in the book of Hebrews. I knew exactly where he was going. It took him awhile to find it though. JW1: Now, I know what your reaction is going to be after we read this. KW: Are you getting to know me pretty well? JW1: Yeah, pretty well I think. Hebrews 13:17. Could you read that for us please? JW1: Most people read that and think, “Be obedient to my leaders? Never!” That is a rebellious spirit. Here, the Scriptures are telling us to obey the directions we receive from those who are taking the lead. He began telling me that when he was challenged by the Witnesses to stop smoking, the only reason he listened to them was because every other suggestion he tried, worked and made his life better. JW1: Because I trust those taking the lead, I follow their direction, even when I don’t necessarily understand it. Now that’s not blind faith because everything else they told me is true. I wanted to scream, “CULT!” One of the marks of a cult is that understanding is not necessary, but believing is. JW1: It is like Abraham going to sacrifice Isaac. KW: What you’ve just done is put your leaders on the same level as God. There was that same look. He spoke slowly and his eyes blinked very quickly as if I had just slapped him in the face with a wet sock… again. This is roughly the half way point of our conversation. The intensity of the second half is more than my Pioneer friend and I have experienced with each other. It will be posted tomorrow. Please continue to pray for my Pioneer friend and his family. As you will see in tomorrow’s post, there is hope. The Scriptures are telling us to obey the directions we receive from those who are taking the lead as when Noah’ days built the ark and preached to everyone by Obeying Jehovah direction’s -the conclusion was only him and his family survived the flood. Did you read the whole post before you made your comment? Dstettbner, You’re right that we are to obey the directions we receive from those who may be in a position over us . However, this is not to be a blind obedience . prophet today, His channel — that prophet is to be avoided because spiritual safety is at stake . Oh how I thoroughly enjoyed reading your experience studying with Jehovah’s Witnesses!! I LOVED the part where you compared smoking with gluttony, and you are sooo right!! I shared that with my daughter and we both had a good laugh. Very Important Point You Bring To Their Attention, They Are Putting The Governing Body on par with GOD. Exactly!! I look foward to reading part 2!! p.s. kudos for not losing your temper!! Thanks for your encouragement. Part two will be up later this morning. No, that’s absolutely not true. Most obesity is due to over-consumption of calories. For example, an average male can eat 1 extra chocolate bar (300 calories) per day for a year, while eating normal (healthy, regular sized) meals at all other times and put on 30 pounds (with no other changing factors). Even you would not consider that gluttony I would say, and if you do, then your definition of gluttony is made up to suit the point you’re trying to prove. For most people being overweight comes from a long-term steady intake of more calories than they burn each day, and the western world has a problem with this because of increasingly sedentary lifestyles and increased fat and sugar (calorie dense, and taste-making food additives) compared to what we evolved to handle on the Savannah when we hunted/gathered our own food. Not even remotely connected to gluttony. The main idea behind gluttony is the lack of self control. If you find yourself gaining 30 pounds a year, you’ve got an issue with self-control. As Christians, we are taught that we are to control our appetites, not the other way around. Here is a short article about gluttony. Awesome, can’t wait to read the 2nd part! I understand your comments, self-control is important. But…what if I eat an extra chocolate bar every third or fourth day, just one, as a treat. In 3 or 4 years, I’ll be 30 pounds overweight. Still gluttony or a lack of self-control)? Or, an even better example, what if someone has 1 can of coke (non-diet cause they hate the taste of the diet stuff) a day, in an otherwise perfectly healthy balanced diet, that’s enough to put them 30 pounds overweight in under 2 years. Still gluttony or a lack of self-control? Don’t think I’m being nit-picky here, THIS is how regular people become overweight, not gluttony. Thanks again for commenting. Are you suggesting that all I need to do to lose 30 in a year is delete a candy bar’s worth of calories from a diet a day? I’m pretty sure there is more to it than that. Yep, that’s exactly it. 300 extra calories a day is just over 30 pounds in a year. “How do I lose weight? To lose weight you need to create a calorie deficit, which means you need to burn more calories than you take in. You can do this by decreasing calories consumed or increasing your amount or intensity of exercise. Plan to lose ½ -2 pounds per week. Losing more than that may indicate you’re eating too little or exercising too much. One pound of body fat equals about 3,500 calories. Read through the following examples to help you calculate a calorie deficit. 1) If you reduced your daily caloric intake by 300 calories per day, how much weight would you lose in 1 month? 2) If you burned an extra 100 calories per day by walking for 30 minutes 5 times a week, how much weight would you lose in 1 month? Note: Lowering your food consumption is also FAR more efficient than exercise as you can probably tell from those figures. Would you not agree that there is a big difference between people who are over weight and people who are grossly obese? Of those Jehovah’s Witnesses who fit the latter, I find it hard to believe they are guilty of eating an extra candy bar a day for 10 years. But for the sake of argument, let us assume that is the case. This behavior would still fall into the category of being addictive and physically dangerous which are the exact reasons why the Pioneer said someone should be kicked out for smoking a cigar. My point remains, the Watchtower is inconsistent. Anyway, the problem is you’re still conflating over-consumption of calories with addiction/gluttony. An addiction is a “compulsive physiological need for and use of a habit-forming substance (as heroin, nicotine, or alcohol) characterized by tolerance and by well-defined physiological symptoms upon withdrawal; broadly : persistent compulsive use of a substance known by the user to be physically, psychologically, or socially harmful” – Merriam-Webster. Food and even over-eating does not meet any of those criteria; it’s not habit-forming (rather it is necessary for not-dying :), you cannot develop a tolerance, there are no withdrawal symptoms and the food itself is not harmful. In fact, the eating of large amounts (gluttony) is not, in itself, any sort of problem. we could eat plates and plates (and plates) of fresh vegetables for most of our waking lives and we would struggle to put on any weight at all (because veggies have so few calories). Sugars and fats have often been singled out as addictive, but studies so far are inconclusive on the addictive effects of even these most vilified of food substances. Submit , or else ! they are reminded that only the “slave ” will decide what is a accurate teaching . Jw’s simply get in line and march in step unless they want to invite trouble . any new direction they would give him etc . established by them , one that reveals a clear picture — confusion . to trust religious leaders like the ones who run the Watchtower organization . Freedom from false prophets or legalistic religious leaders is available — Matt 11:28 . Question: NWT (a god) instead of (God) KJV how does that line up with [Isaiah 45:5]… no other God beside me? and how can “a god” become flesh? This is completely off-topic. I will not allow any comments which attempt to answer this question.